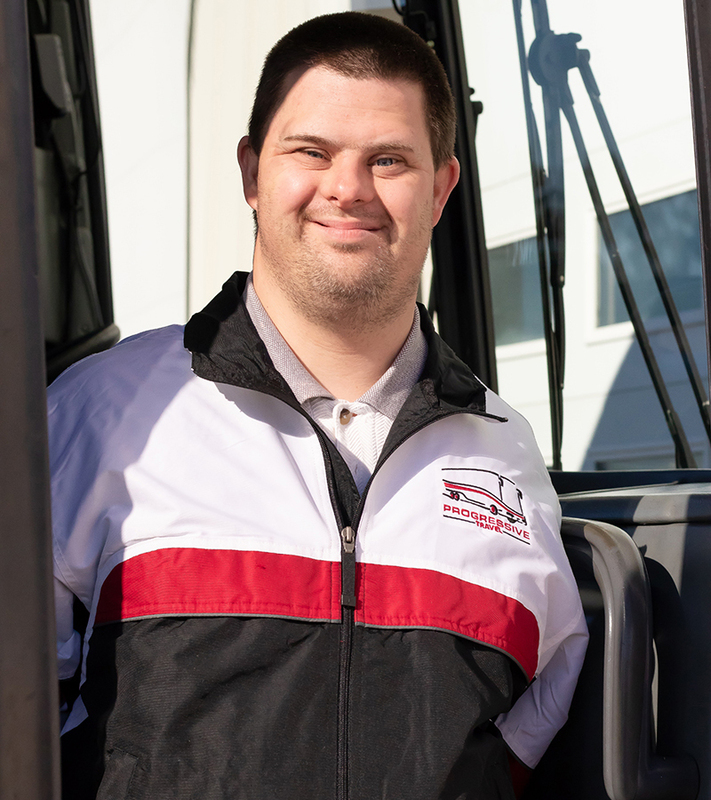 When Justin was attending grade school, he was a passenger on a special needs school bus operated by Burnett Transit - the sister company to Progressive Travel. The staff at Burnett Transit felt that Justin would be better served by being removed from the special needs bus that he was on and instead be mainstreamed onto a regular school bus route. Against the better judgement of school staff and caring parents, we were granted permission. What happened next changed the life of Justin and all of us! He loved riding the regular school bus route. Suddenly, Justin started blossoming at school. He was so excited about buses that the school asked us if we could find something for Justin to do at the bus garage for just one hour a week. That was the beginning of Justin coming to work for us. When Justin first started at Progressive Travel, he would barely talk to anyone. After graduating high school, Justin started coming to work once a week for a whole day. At the beginning of working a whole day, Justin was still very apprehensive. After years of being part of the company, Justin has flourished. He talks, jokes and laughs with anyone and everyone. He knows every driver, every salesman that stops by our facilities and looks forward to his time with us. Justin works both in the shop helping out the shop staff and our quality control department as well as helping in the office. He isn’t afraid to have fun with his co-workers. At more than one time, all of us have been fired by Justin! Thank goodness he’s only teasing!! Justin has changed the culture of our company. He has absolutely blessed us with his presence.